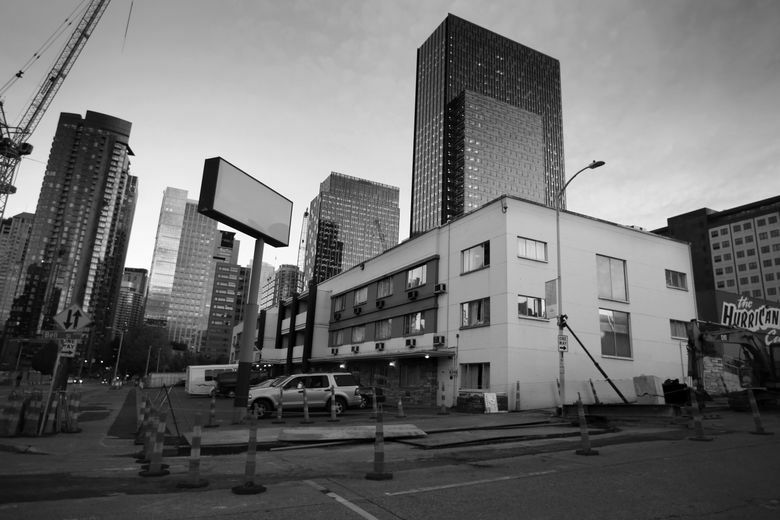 The city’s empty buildings are a sign of prosperity, but a nightmare for neighbors and police. Meanwhile, a homeless advocate wonders whether the abandoned buildings present an opportunity. EVEN NOW, Andrew Glass is mystified. How, in less than 24 hours, he wonders, did squatters learn that the house next door was empty? His best guess: the porch. Barely visible from the street behind overgrown trees and a waist-high wall, it was littered with boxes and miscellanea when graduate students moved out of the four-bedroom home earlier this year to make way for a 41-unit apartment building and commercial complex. Their move added one more vacant building to the hundreds sitting around Seattle, and set off a series of events that has become as ritual here as in any Rust Belt city still recovering from the housing recession. The day after the students moved, a man with a bicycle tentatively approached the tired 105-year-old house next door to Glass’ home. He circled the yard once, then left. That night, a couple arrived. They hung fabric over the windows for curtains, turned on lights and settled in. After two nights, a few more people moved in, quietly going about their business. For a week or more, the house looked much as it had during the seven years Glass and his family had lived next door. Glass and his wife, Zequn Ma, both natives of big cities, adopted a live-and-let-live approach to their mysterious new neighbors. The detritus on the porch dwindled as people picked through it for treasures. Graffiti appeared and disappeared under a coat of new paint applied by the development company. Boards were stripped from the side of the house to expose the crawl space, a potential source of copper pipe and wire. As months passed, Glass had “less confidence” in the people climbing in and out of the house, which sits about 30 feet from his property, separated only by a fence and an alarm system. “They always come in the night while we’re sleeping,’’ he says, pulling back the curtain on a bedroom window that offers an expansive view of the comings and goings next door. Glass began documenting the house’s decline, photographing the once-tidy carport after it became a garbage dump that spilled into the yard. An abandoned shopping cart joined a trashed-out microwave, assorted food wrappers and the cap to a hypodermic needle. 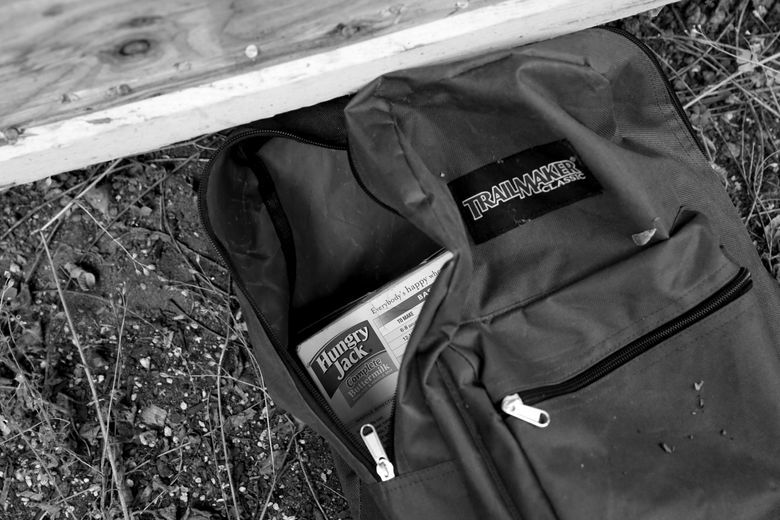 The smell of human excrement wafted toward the rear alley. One day, a tent structure appeared by the entry to the basement, and a whir of activity went on until about 5 a.m.
“They weren’t fighting or struggling, but they were busy,’’ Glass says. Another couple took up residence out front in a parked van. They partied in the house, then returned to the van to argue until the early-morning hours. People camped in the narrow strip of lawn between two abandoned houses on the corner, or in the bushes during the day. Still, there seemed to be an invisible force field that confined the action to the side of the fence that separates the two yards. No one even bothered the family’s car, sitting in the alley in plain sight. Glass called police twice when he saw people breaking and entering. Mostly, he called the Seattle developer, who dispatched a handyman to board up the pried-open windows and doors, clean the yard and cover up graffiti. When the developer finally started asbestos removal in September to prepare for demolition, 10 to 20 people were cleared from the building, Glass says. But not even warning signs for the asbestos removal shut down activity. A recent visit to the house showed that the nail-rimmed plywood that had secured the back door had been pulled off and propped up against the door frame, facing backward. By the time you read this, the lot should be scraped clean to make way for the new development. But you won’t have to go far to see similar scenes. 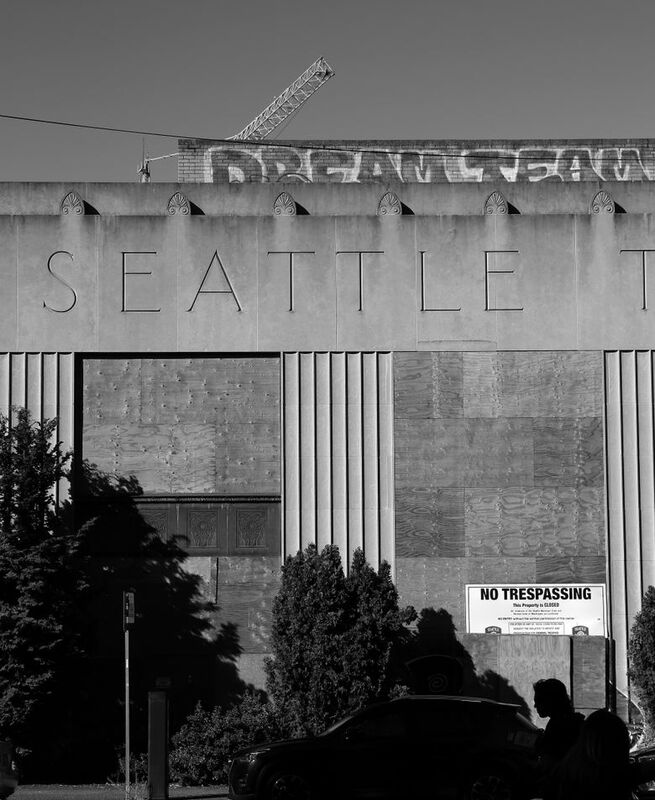 The prosperity visited on Seattle has produced a growing number of empty buildings, along with the problem that has bedeviled communities around the world: the vacant building syndrome, where a once-functioning building devolves into an eyesore, a temporary home for squatters and a magnet for crime. 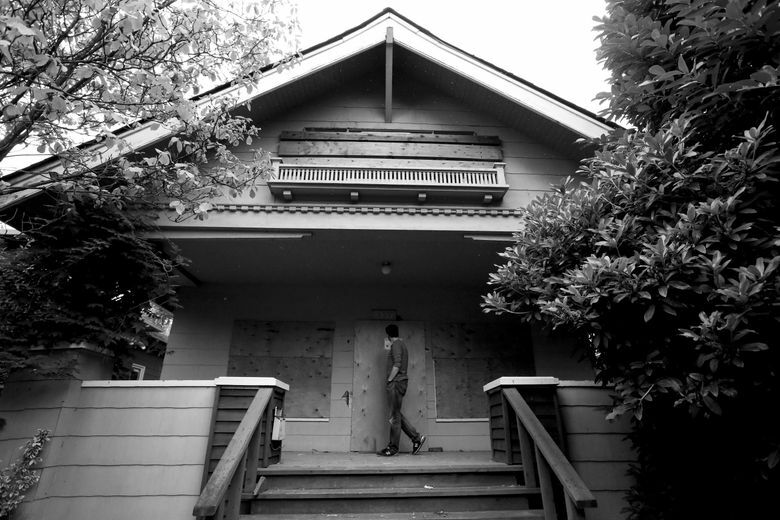 In the absence of any social or political movements like those of the late 1960s and 1970s that saw minority activists in Seattle use abandoned building occupations to advance social justice causes, the empty buildings of Seattle are now mostly a testament to the city’s wealth, and a hassle for neighbors and cops. 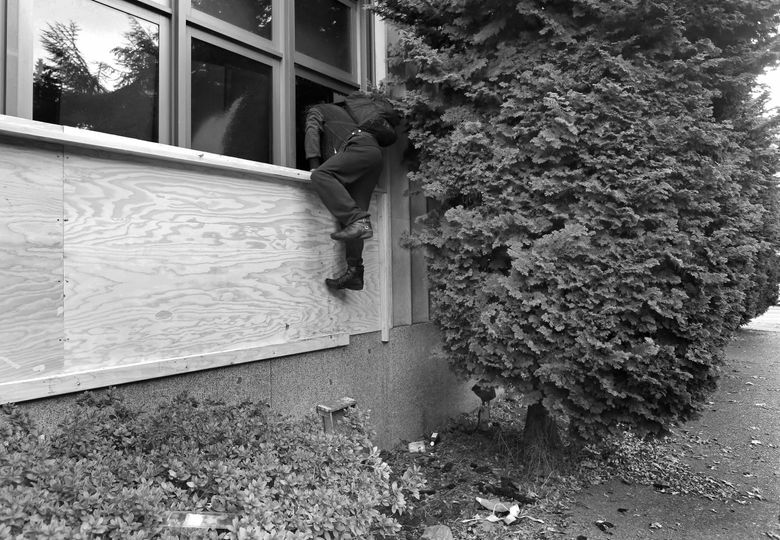 SEATTLE POLICE OFFICER Dave Moore is patrolling the East Precinct at about 4 a.m., when the call comes in: A security guard at Seattle University saw two people break a window and enter an empty two-story building on First Hill owned by Swedish Medical Center. Moore heads to the scene. Two other officers arrive, along with the acting sergeant on First Watch. A man and a woman in their late 20s emerge from the front door of what used to be an office building, offering an improbable story about breaking in after hearing screams inside. The officers line up with guns drawn to search the structure. 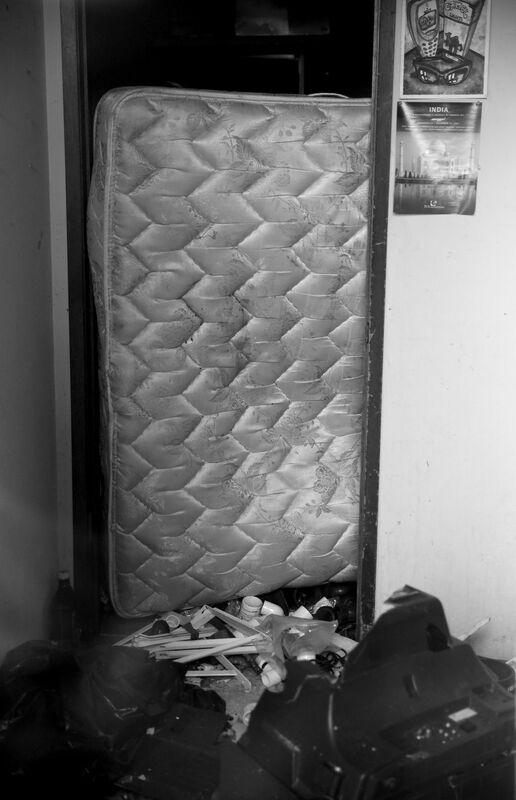 As they move from room to room, their flashlights light up trash-strewn floors. 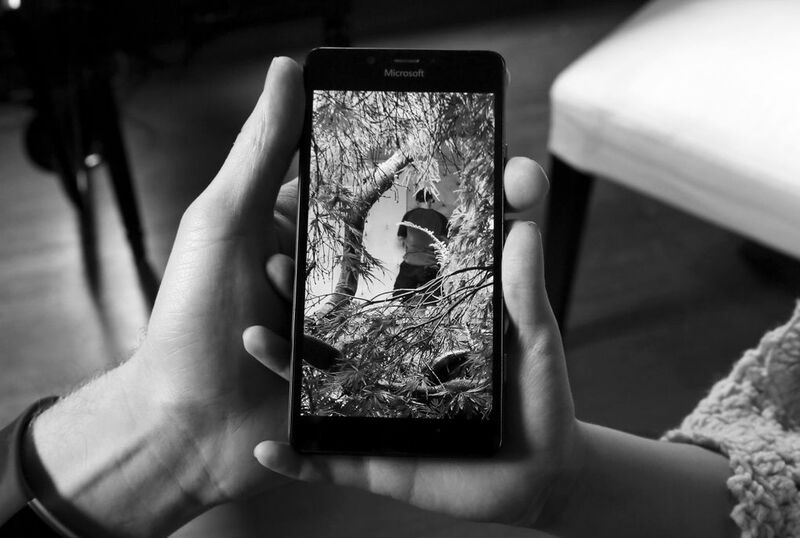 The call lasts nearly an hour, and turns out to be a complete waste of time and resources. Back in the patrol car, Moore checks the call history at the address: In the first five months of the year, police have responded to trespass calls at that building at least a dozen times. It’s not even the worst offender. 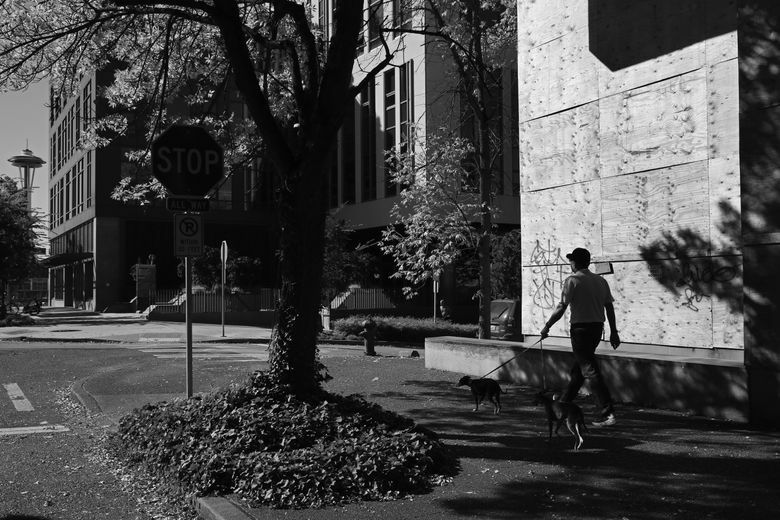 Moore drives through Capitol Hill, pointing out some of the vacant homes he patrols routinely for the sake of the neighbors next door who live with constant foot traffic at night. Some of the buildings have been empty for more than a year, he says. It’s not just police time that’s consumed, either. Last year, the Seattle Fire Department responded to 14 fires in abandoned structures, including one at the former Seattle Times building, where as many as 200 people were squatting after the newspaper moved to new offices in 2011. 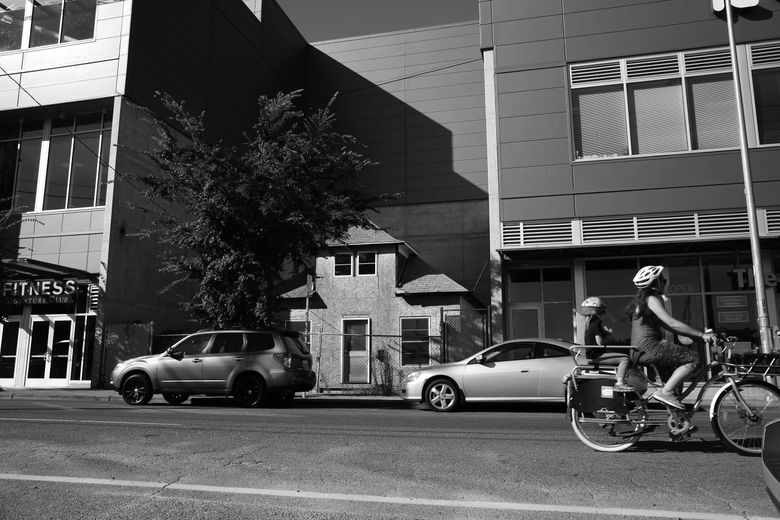 The building, located in prosperous South Lake Union, has served as a chop-shop for stolen bicycles and a drug den and crash pad for an assortment of homeless people and criminals with lengthy rap sheets. One fire chief called the building “a death trap” after a fire there this year, and a police spokesman declined to provide a tour of the building, saying “booby traps” made it unsafe to enter. The structure is owned by a Canadian company that has applied for a demolition permit to redevelop the site. No one keeps an official count of empty buildings in the city, but demolition permits give a good indication of the number of buildings that have stood empty in Seattle: Over the last 11 years, the city has issued 6,365 demolition permits. Of course, not all the empties are awaiting redevelopment. 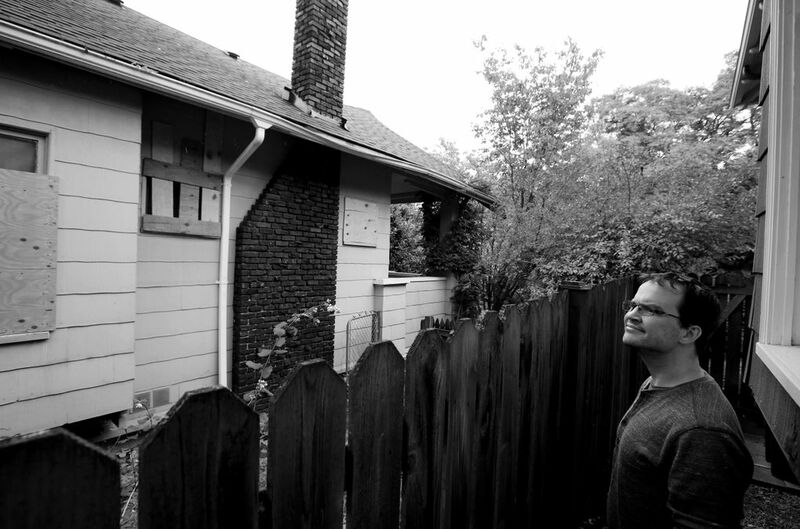 For the better part of seven years, the city battled with notorious landlords Hugh and Martha Sisley over derelict houses they owned along Northeast 65th Street and 15th Avenue. Three boarded-up houses were removed last year, but the area around the intersection remains blighted and fenced. 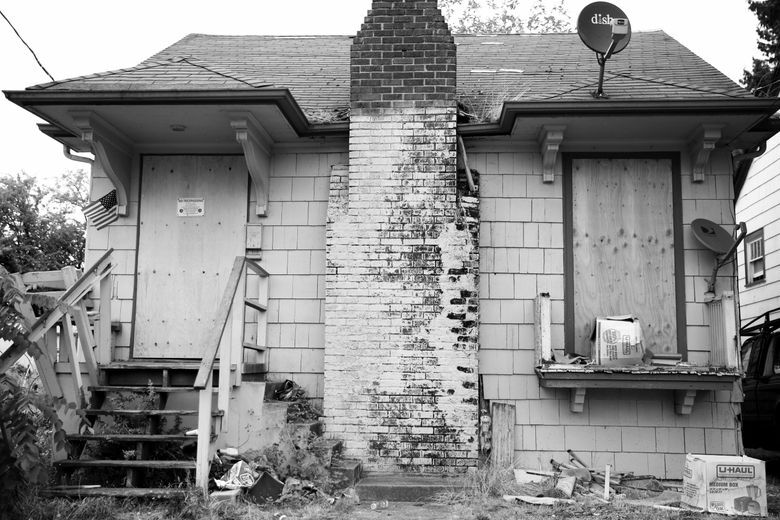 Last year, Seattle’s construction department logged 364 complaints about vacant buildings, a 54 percent increase from only three years earlier. Nearly as many were taken the first nine months of this year, most of them related to unsecured structures, squatters and garbage. Most of the complaints originate from Seattle’s North End, with Green Lake showing the largest number. “A vacant building on its own is not illegal, but it must be kept secure from entry and closed to the weather,” says construction department spokesman Bryan Stevens. The city is investigating 214 buildings for violations, but Stevens says there are others that are empty, but secure, or that haven’t been reported. The city’s general policy requires vacant properties to meet minimum standards for future use. “We don’t want people leveling usable housing without a well-thought-out plan to rebuild,’’ Stevens says. No one’s allowed to knock down a building until he’s applied for a permit to erect something in its place. The only exception: a house that has stood empty for at least 12 months. The department is recommending that housing in those zones be demolished sooner if the building has been vacant for several months, and plans to introduce new rules for “unfit buildings” that are likely to remain empty and derelict. One activist says the city could solve two problems by making the empty buildings part of the solution for homelessness. 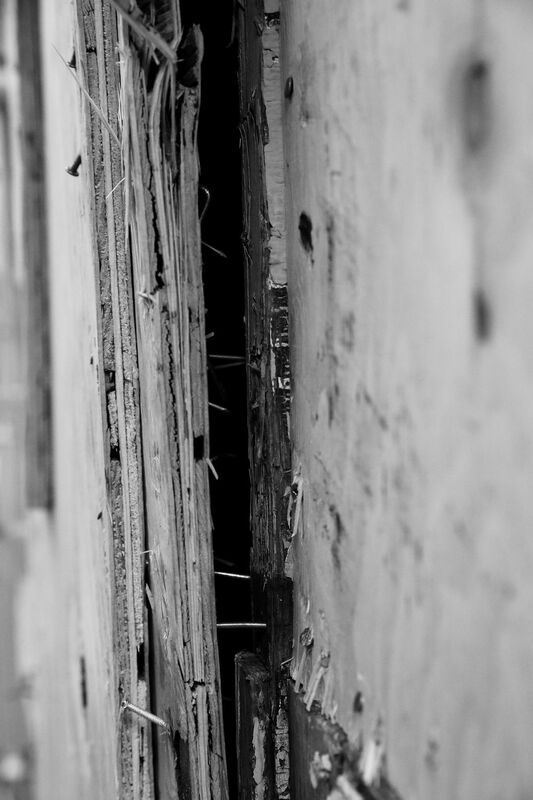 CORY POTTS HAS developed a keen eye for abandoned houses. 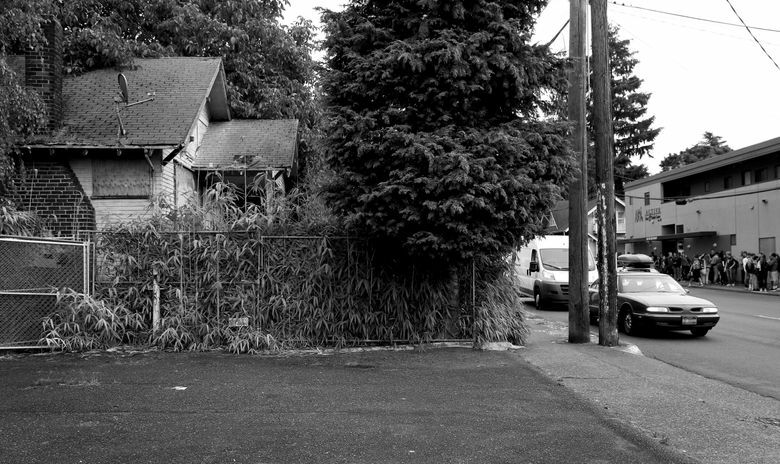 We’re driving around Ravenna, when Potts, a community organizer with Common Cents, points to a white split-level home with a gangly tree obscuring the front picture window. “This one is probably empty,’’ he says. It’s got all the telltale signs: an overgrown yard, blinds that stay in the same position, a light that’s always on, garbage and recycling cans that haven’t moved for weeks. 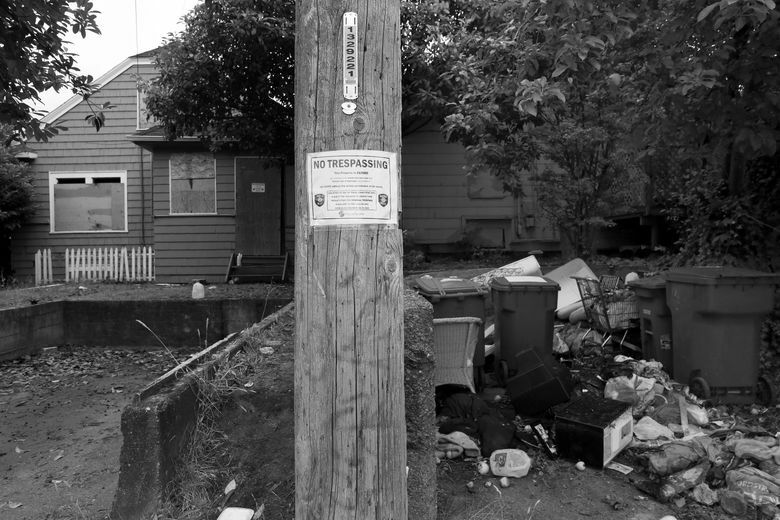 He spotted the same signs at a house a block away in May, and wrote a letter to the owner, who lives in Bellevue, to see whether he would consider allowing it to be used as temporary low-income housing. In his letter, Potts, 30, described his experiences living in Brussels, Belgium, for several years as a Fulbright Fellow and graduate student. He joined — and eventually became co-president of — a housing collective there that has provided temporary housing for hundreds of people without government subsidies simply by negotiating with owners of buildings that are not being used. “I would love to adopt this form of housing collective to the city,’’ he wrote to the property owner. He never heard back. But Potts isn’t giving up. We head south, stopping at numerous vacant properties: a city-owned office building once used for vehicle repair. A three-story, 21,000-square-foot office building on Boren Avenue. A two-story office building in the University District, empty, except for the parking lot, which has become a staging ground for light-rail construction. We also visit a motel that was once a dormitory for the Cornish School of the Arts before it was shuttered, its parking lot turned over to the construction workers building a skyscraper for Amazon across the street. It’s nearly identical to another motel a block away that now serves as a temporary homeless shelter run by Mary’s Place, a not-for-profit that has operated temporary shelters for homeless women and families for 17 years. The organization, which spends its money making empty buildings habitable until it’s time for the building to be razed, can serve more people that way than by building a permanent shelter, says Mary’s Place’s executive director Marty Hartman. 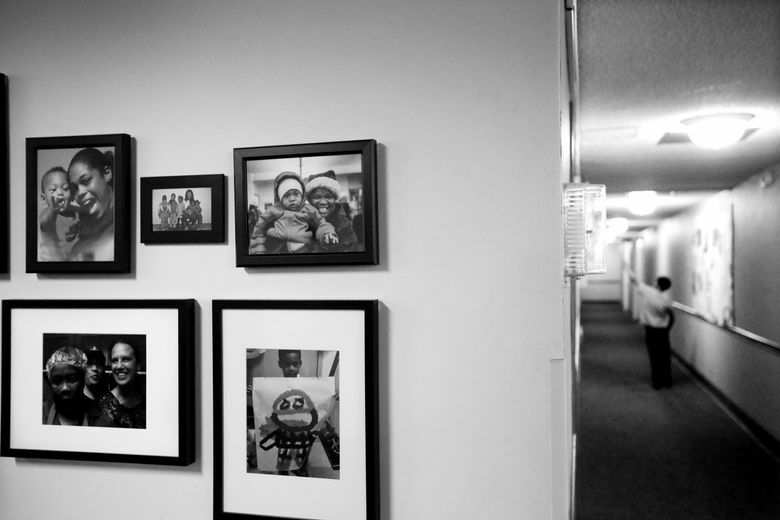 Mary’s relies on a network of partners who contribute everything from furniture to food, and focuses its efforts on providing assistance and training to help families get back in the workforce, and into affordable housing. 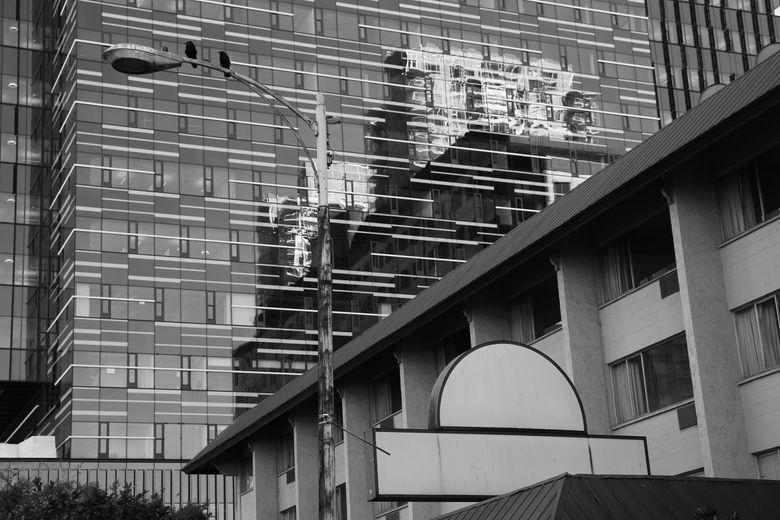 In the past, Seattle has opened unused city-owned properties as shelters, but Mayor Ed Murray has no current plans to use them as a temporary solution while permanent housing is planned and constructed, according to the mayor’s spokesman, Benton Strong. “We’ve done it previously,’’ Strong says, “and if we found an organization, we’d probably consider it.” He said the issue is more complicated than just opening up the doors. But Potts says it’s hard to understand why a building would be deemed unacceptable to house people when those same people are living outside among rats, without running water, toilet facilities or a place to store their belongings and food. Potts says the city could allow people to make a community for themselves away from the elements so they can address other problems in their lives without having to spend their days meeting basic needs. He points to a rickety wood structure at a homeless encampment east of CenturyLink Field that might one day be a shower, provided someone figures out how to deliver large volumes of water. Potts, who visits the camp once or twice a week, proposed bringing a water-bed mattress on a trailer to provide water for showering and drinking. One of the leaders of the 200-plus community appreciated the ingenuity, but nixed the idea, saying someone would just stick a knife in it for kicks. Potts says he doesn’t advocate people breaking the law to squat in buildings, but he laments the passing of a social justice movement that once leveraged empty buildings to help people. 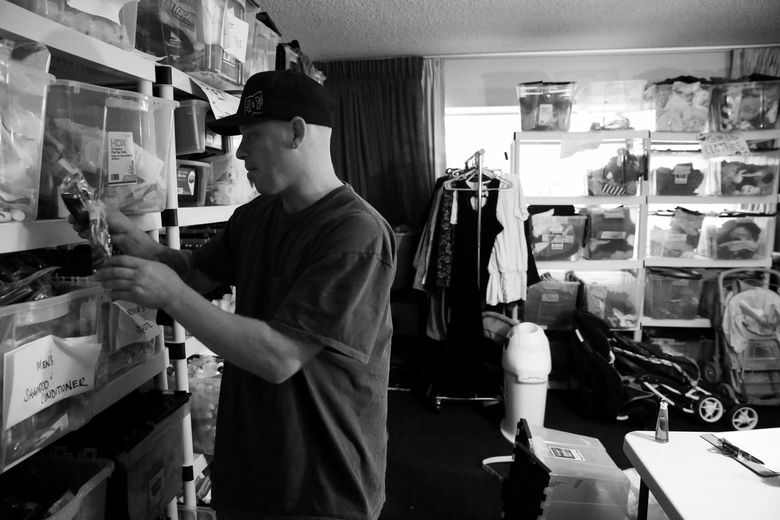 “Imagine if all those people living outside organized themselves,’’ he says. “Sometimes it’s just getting people to see outside their own head,’’ he says. 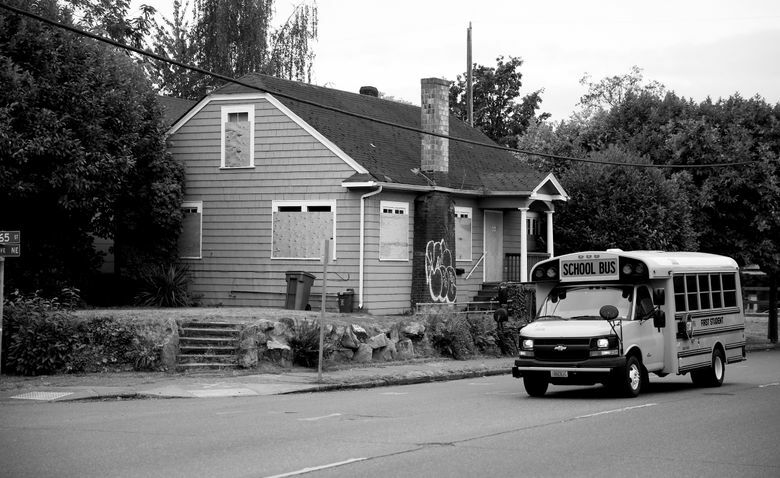 Seattle has thousands of people living on the street and at least hundreds of vacant buildings. Potts would like to do more than dream. He would like to play matchmaker. Susan Kelleher is a Pacific NW magazine staff writer. Reach her at skelleher@seattletimes.com or 206-464-2508. On Twitter: @susankelleher. Ken Lambert is a Seattle Times staff photographer.